352 labyrinths found. Showing 241-260. Sorted by country, state, city, then zip/postal code. A walking meditation is available for students, faculty and staff three times through the school year, once during Advent, Lent and once during the month of May. 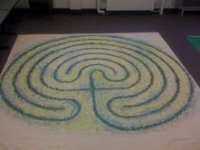 A 36 foot canvas, eleven-circuit Chartres Cathedral style labyrinth is brought into the Great Hall. A quiet environment with meditative music surrounds walkers as they slow down to pray and meditate amidst their busy days. Baltic design with colorful embellishments of butterflies, dragonflies, ladybugs and more. Concentric 7-circuit labyrinth similar to 9th century manuscript design from Aachen, Germany. Courtyard is open during normal business hours. 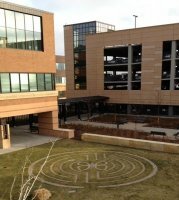 The labyrinth is located in a small patio area at the rear of the building. A sidewalk leads around the building from the front. It is also easily accessible from the alley behind the building. 3-circuit classical style. The garden patio area also includes a wailing wall feature and contemplative gardens. David Gifford, Long Meadow Designs, Inc. This was an Eagle Award project coordinated by Scout Peter Kruse, member of the congregation. 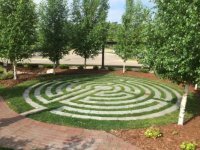 The labyrinth is located to the east of the church buildings, behind 761 Summit Avenue. The entrance is off Portland Avenue, across from the playground. One of several labyrinths available to rent. Tree of Wisom design handpainted on canvas. $50 rental fee. Contact the Wisdom Ways office for information or to arrange for rental. Note: Pick-up and return location is Carondelet Center, 1890 Randolph Avenue Saint Paul. Items may be shipped for an additional charge, please inquire. 7-circuit concentric classical, handpainted on canvas. 12 feet concentric three-circuit island contained within four circuits of water painted on a square canvas. Good for an individual, small group, or to be used in conjunction with the larger labyrinths. Rental fee: $50. Contact the Wisdom Ways office for information or to arrange for rental. Note: Pick-up and return location is Carondelet Center, 1890 Randolph Avenue Saint Paul. Items may be shipped for an additional charge, please inquire. 7 feet Heart of Chartres style, three-circuit, pink and gold paint on a square canvas with a rose theme. Suitable for wall or floor use. It can be walked with room to stand in each of the petals of the central rosette. A person may sit within the center or lay down and still be contained within the circle. $125 rental fee. Contact the Wisdom Ways office for information or to arrange for rental. Note: Pick-up and return location is Carondelet Center, 1890 Randolph Avenue Saint Paul. Items may be shipped for an additional charge, please inquire. 23 feet Waters Weaving seven-circuit Santa Rosa style with blue, rust and sage green paint on a round canvas. Created by Marilyn Larson during the Katrina crises. The fee will be given to Habitat for Humanity, Hurricane Katrina relief efforts. $100 rental fee. Contact the Wisdom Ways office for information or to arrange for rental. Note: Pick-up and return location is Carondelet Center, 1890 Randolph Avenue Saint Paul. Items may be shipped for an additional charge, please inquire. 18 feet five-circuit with several blue and brown acrylic colors on a square, cream canvas. This labyrinth is called the Watermark or Beach labyrinth and invites the walker into the atmosphere of water and sand. 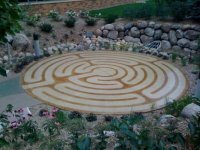 Children and adults love to walk and play on this labyrinth. Stonetree Spiral, five-circuit. Earth tones paint on a rectangular canvas. This original design invites the walker into the embrace of the World Tree. A spark of Spirit shines in the crown. Good for an individual or a small group. Classic style, seven-circuit, shades of green and yellow paint on a square canvas. Good for an individual, small group, or to be used in conjunction with the larger labyrinths. Classic style, three-circuit, six colors. Canvas. Good for individual or small area. Will easily fit in a living room. 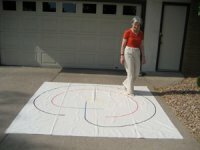 $25 per labyrinth. Contact the Wisdom Ways office for information or to arrange for rental. Note: Pick-up and return location is Carondelet Center, 1890 Randolph Avenue Saint Paul. Items may be shipped for an additional charge, please inquire. This Labyrinth may be rented for a donation. Contact the Wisdom Ways office for information or to arrange for rental. Note: Pick-up and return location is Carondelet Center, 1890 Randolph Avenue Saint Paul. Items may be shipped for an additional charge, please inquire. Contemporary chalice design, a variation on the classical pattern. 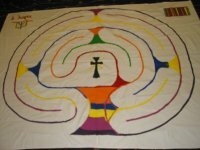 Medium 3-circuit Alpha Omega canvas labyrinth with multi color design painted canvas approximately 8x8 feet.